If you're picking purple for your new return address labels...that says a little something about your personality. People who like purple are often creative thinkers and big dreamers who can also be a bit impractical from time to time. Sticking purple labels with a plaid pattern on your outgoing mail may seem to be another one of your unusual ideas. But we think it's a pretty good one! Plus, these labels are self-adhesive, which means the often tedious task of filling out envelopes is going to get a whole lot easier! Say so long to scribbling you your name and address. Just peel and place! 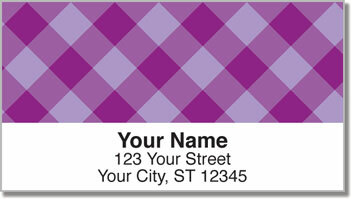 Order your own Purple Plaid Address Labels right now! Look for other colors, and take a look at the matching checks too!